The gapless indicator set is a collection of TradeStation indicators and functions designed to eliminate the effect overnight gaps have on technical indicators. Each gapless indicator works in the same way as a regular indicator and includes the same settings and values except that the gapless version transitions seamlessly between the market closing and opening again the next day. By eliminating the effect of the opening gap these indicators can react immediately to the market instead of waiting to catch up to the market after the gap open. This is especially true for intraday traders where something as simple as a 20 bar moving average indicator will take 20 bars to catch up to the market after a gap opening whereas a gapless moving average moves with the overnight gap making it more effective sooner. In addition to a gapless bar indicator which can display market prices without gaps we have also provided gapless versions of 17 popular TradeStation indicators as part of the gapless indicator set. As part of the gapless indicator set we have also included a set of gapless TradeStation functions which can be used in building or modifying your own gapless indicators and strategies. The functions provide gapless prices for the open, high, low and close of the market in question. 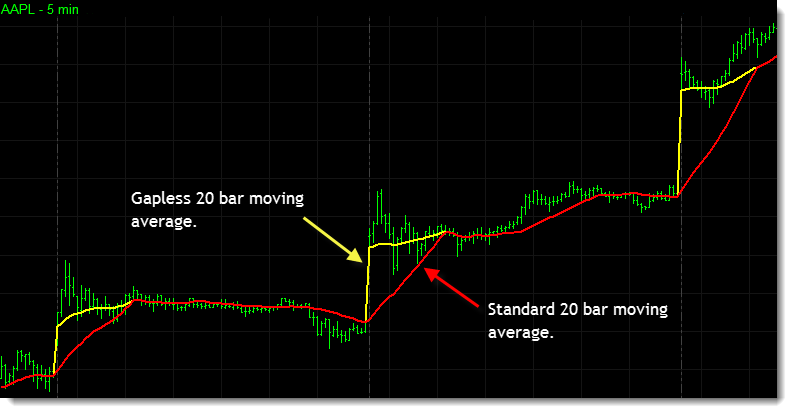 The intraday chart below compares a standard 20 bar moving average (in red) with a gapless 20 bar moving average (in yellow). Notice how as the market gaps higher there is a delay as the standard moving average slowly catches up, but the gapless moving average gaps with the market making it effective sooner. 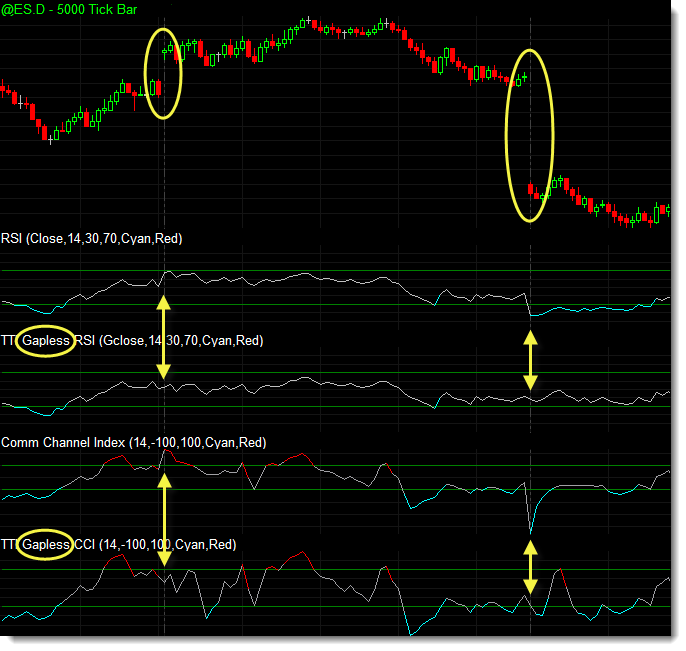 The tick chart of the S&P 500 below compares the standard and gapless versions of two popular oscillators, the RSI and CCI indicators. The higher and lower opening gaps have been highlighted in the chart to illustrate the difference in the effect gaps have on the two indicators. 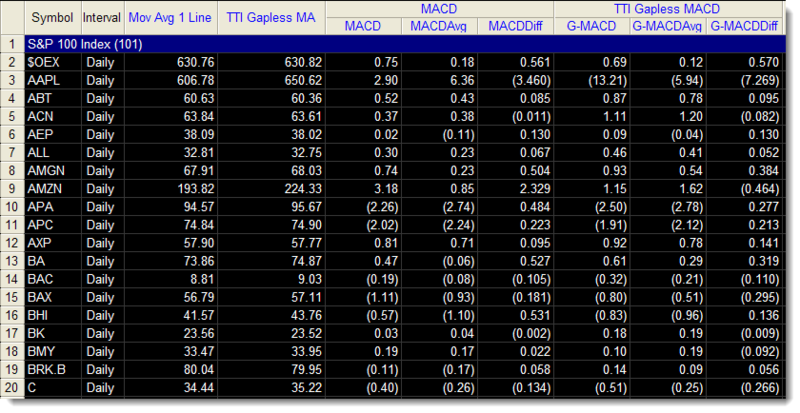 Click to view all gapless indicator screenshots. The gapless indicator set contains gapless versions of 17 popular TradeStation indicators. Each gapless indicator works the same way as the regular TradeStation indicator and includes the same settings and produces the same values as the original, including alerts. When applied to a RadarScreen each gapless indicator displays in the same way as its TradeStation counterpart. The RadarScreen contains the regular versions and gapless versions of both a simple moving average indicator and a MACD indicator. Click the button below to add the Gapless Indicator Set for TradeStation to your wish list.